Inside the huge game room at Malibu Norcross you will find incredible games for every age. 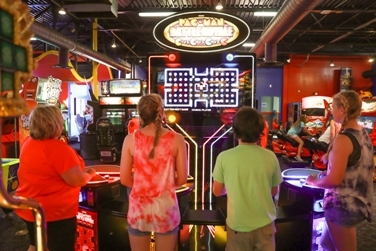 Malibu Norcross offers everything from Classic Games like Skee-Ball and Air Hockey to all of the hottest games. Don't forget the redemption games where you can win tickets to be redeemed at our awesome prize counter. Our Game Room uses Game Cards that you can load with any dollar amount! Malibu Norcross Game Room brings out the kid in everyone! From dancing games, to sport games, and everything in between, our game room has it all! The Game Room at Malibu Norcross has games the entire family can play! Enjoy games such as Crossy Road, Pac Man Battle Royale, Ghostbusters, and Fruit Ninja. Join us every Tuesday for 12 Buck Tuesday! Unlimited Video Games All Day Only $12! Add-on Unlimited Rides and Mini Golf for only $12 More! Our game cards are available in any dollar amount! Select higher amounts for free bonus amounts! $20 Game Card - Receive FREE $5.00 Bonus! $30 Game Card - Receive FREE $10 Bonus! - Best Value! Add a Game Card to your purchase for the ultimate Malibu Norcross experience! Redemption games, games that award tickets and/or prizes, are not included in the 12 Buck Days Unlimited Video Games Promotion.